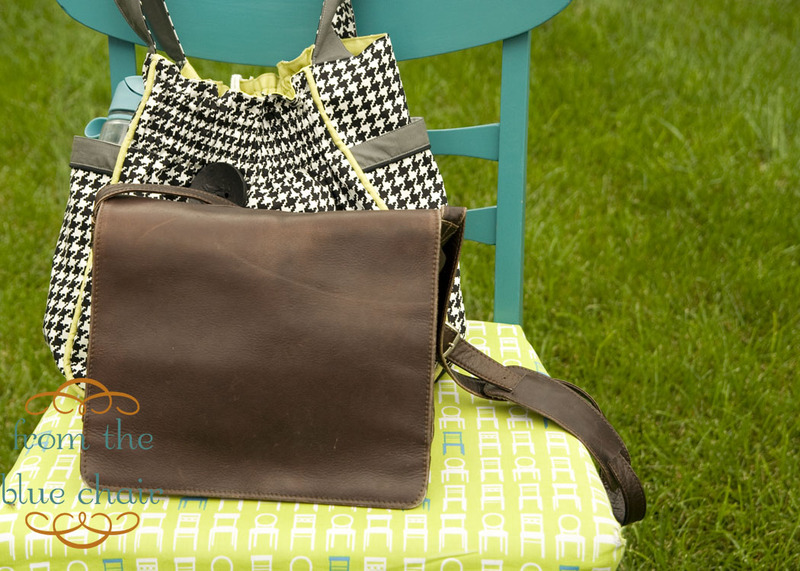 In preparing for Sewing Summit, I decided to make a new handbag to bring along. I wanted something on the larger side for all the Sewing Summit loot and decided to try out a new pattern to Travel Handmade. Don't forget to check out the other Travel Handmade ideas. There is also a great Pinterest board with all sorts of ideas. When I first saw pictures of the Bella Bag on ikatbag, I wanted to make it immediately. Lucky for me, LiEr just finished the pattern over Labor Day weekend. I was literally stalking her site all weekend anxiously waiting for her to post the pattern for sale. I bought it immediately and started getting right to work. 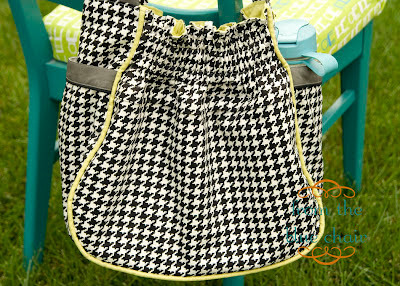 I chose some black and white houndstooth home dec fabric I've had for quite a while. I ordered this fabric online months ago with the intention of making a bag with it. The funny thing when it arrived is that I realized I have a dress from the exact same fabric. I should have modeled them together. I would look a bit too matchy though. The dress has a red belt. With the green trim on this bag, I would look all set for Christmas. The grey fabric is Moonstone from Art Gallery's Pure Elements collection. The green is a home dec solid from Jo-Ann's. I had to add the pink zipper for a little pop of color inside. The piping on the bag was one of the things and initially drew me to it, but it about killed me. I should have cut the fabric on the bias when making the piping. The curves would have been easier. Using the heavier weight fabric was also a poor choice, but I really wanted the piping green like the lining. It was a struggle, but it all worked out okay in the end (as long as you don't look too close). 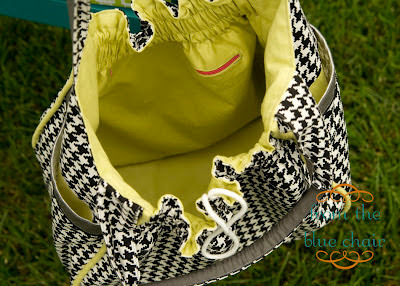 This bag could easily become "The Pit" like other purses I've had. It doesn't have enough pockets inside. Next time I make this bag, I will add a whole side panel of pockets. I might even consider doing panels on both sides. It needs pockets for my phone, pens, lip gloss, etc. The handles actually contain vinyl tubing from the plumbing dept at Lowes. The pattern calls for 3/8" tubing. Be aware that tubing is sold by by the interior measurement as well as the exterior measurement. I initially picked up 3/8" by the interior measurement, but 1/2" exterior. This was the wrong one and was too big. I didn't notice this until after I had cut it. Double check before you cut the tubing to make sure you're getting the correct product. Make sure you purchase the tubing that is 3/8" diameter for the exterior of the tube. Here is the zipper on the back of the bag. I love how big this pocket is. The only drawback is that it's hard to open the zipper because of the top gathers. It's not exactly easy access. I would still choose to put it in the bag though just because it's nice to have a big pocket like this. Here is the back all zipped up. You can barely see where the zipper is. I'd like to take credit for this, but it was pure luck that the fabric lined up so well. 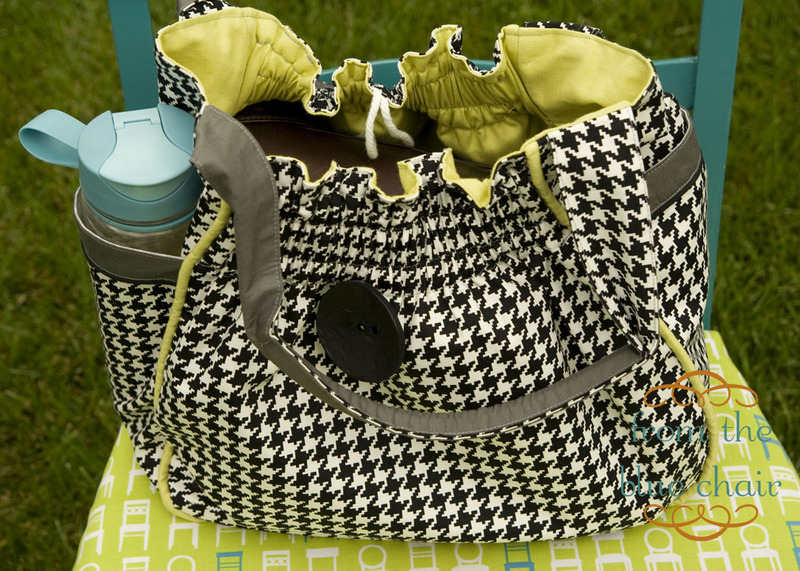 Those big side pockets are perfect for a large water bottle. This is a big bag. Here is it compared to my current purse I'm using. And here is my current purse inside the Bella Bag. It easily fits. I'll have plenty of room to fit all sorts of goodies from Sewing Summit! This pattern was fabulous. I've never made a bag this complicated before, and each step was well illustrated and clearly described. It's a 30 page pattern which seemed overwhelming at first, but each step goes relatively quickly. It's definitely not an afternoon project, but was something fun and different as I don't make many bags. I definitely have plans to make it again. Bags are something that I really want to give a try - this one is very cute. It's a beautiful bag. I like your fabric choices. It looks difficult to make but you're willing to go at it again. Great job! I love that you said it could become 'the pit'. I feel like I always make pit bags! But then I just make more small bags to put inside those big pit bags. It all works out, right? I love it! Perfect as always. what a gorgeous bag!!! Love all the fabric you chose, it looks fantastic! Very nice, Kati! 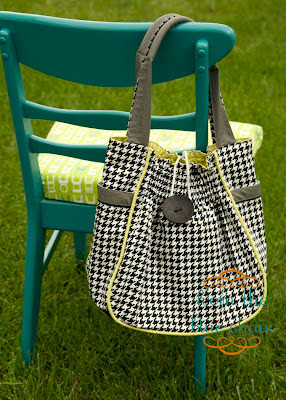 I love the houndstooth with the green. It looks awesome, despite your piping struggles! Nice one! Well done. Thanks for the link to Travel Handmades. This is super cute Kati! I have an enormous "pit bag" that I just end up using all my handmade pouches inside of. In theory, I should be really organized...... but it still ends up being a bit of a black hole. Super cute! 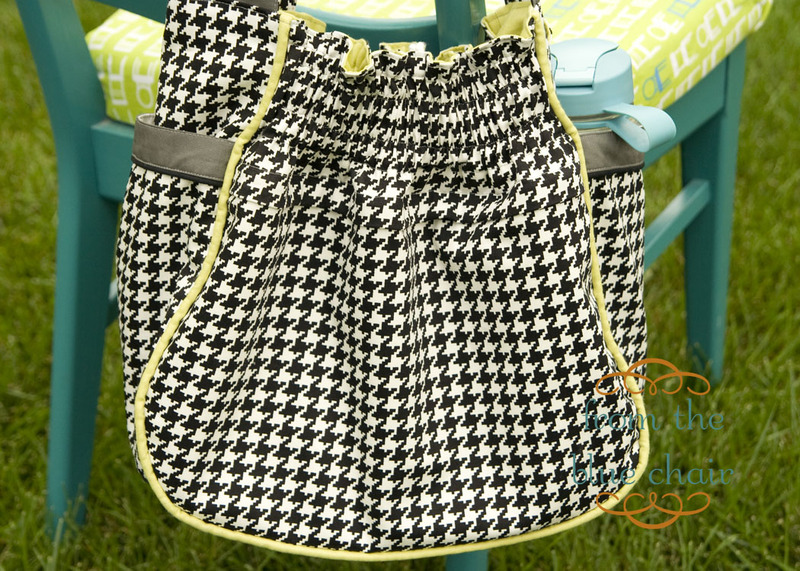 Love the houndstooth, Kati!! 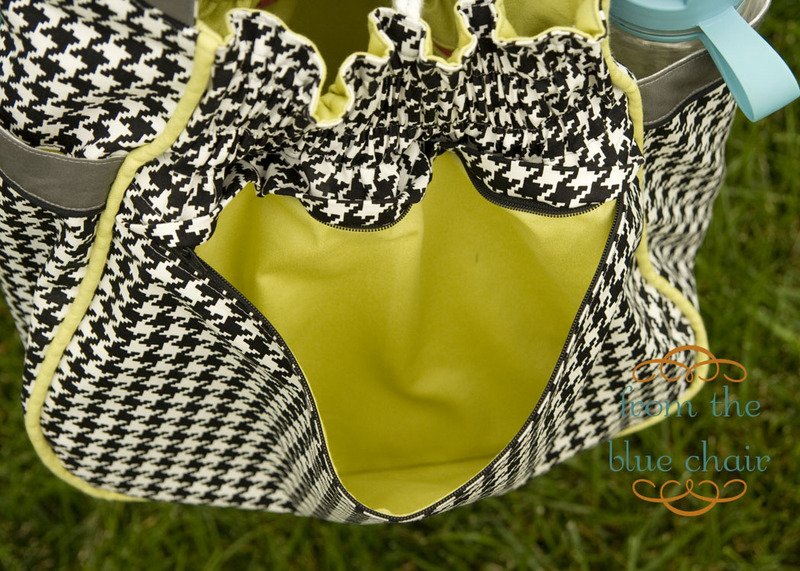 Love the houndstooth - great autumn bag! That is an adorable bag! Great fabric choices. thanks for all the insight on the pattern.